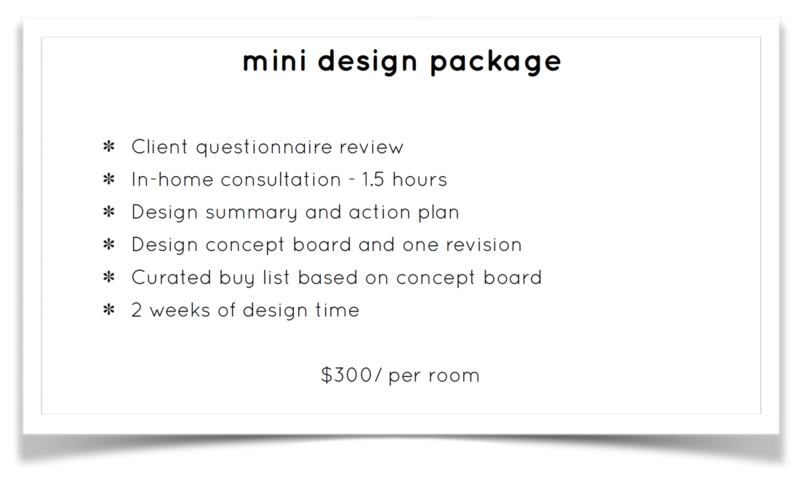 The Mini Design Package is a perfect jumping off point for those that simply need some direction to get their project off the ground. I will visit your home and we can talk through design dilemmas, questions and wants for your space. After our meeting I will provide you with a concept board and a detailed summary of our our time together. It will include a list of suggested project steps that you can execute as well as a recommended source list for your furniture and accessories. ​The concierge buying trip, which includes "Trade" pricing, can also be added. Review À La Carte Services for more add-ons. 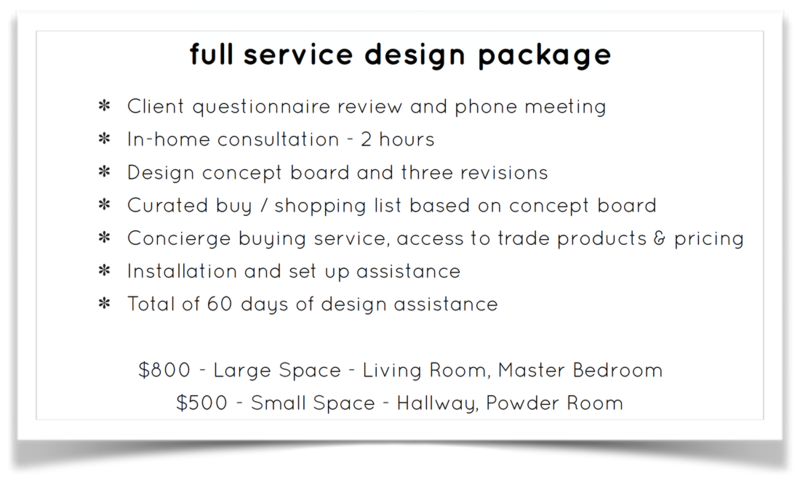 The Full Service Design Package offers clients an incredible value. You will receive a 2 hours meeting, a design concept board with 3 revisions as well as a curated buy list. One of the biggest values of this package is the concierge buying service. This service provides "Trade" pricing and ordering for products that are available at a number of local, national and online retailers. Many of my clients have covered their design costs with the savings they realized through "Trade" discounts on their furniture and accessories. When the shopping is done, I will assist you with room placement. 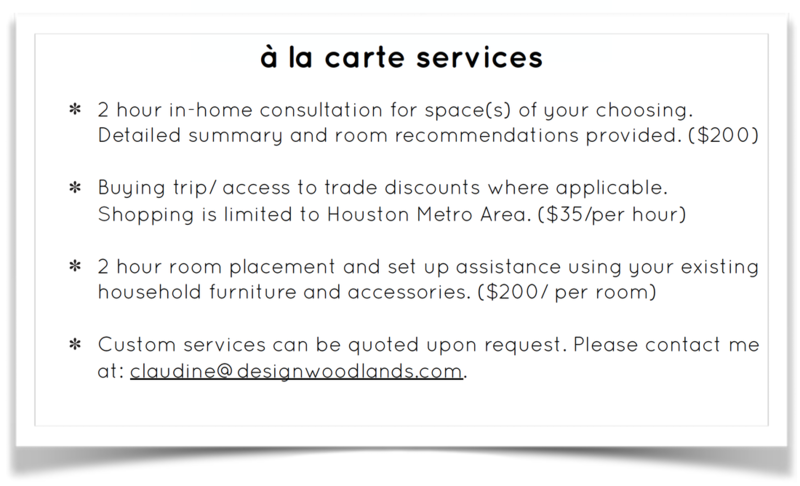 À La Carte Services are designed for those that don't need a comprehensive plan, rather design assistance and inspiration. The varied services are perfect one-off options for those looking for design direction, buy assistance, or room placement guidance. Maybe you have furniture, accessories and stores in mind and need assistance with a buy trip. "Trade" discounts can be applied where applicable. Store such as Restoration Hardware, Pottery Barn , Crate & Barrel, Visual Comfort, The Tile Store and many more offer designer discounts. ​This is also perfect for those who simply need a fresh set of design eyes on an existing space or home. Start your design journey today by filling out a "Client Design Questionnaire".